if you’re a busy mom/person, or you have a child/adult-child who still refuses to eat their greens, I definitely suggest giving these garlic noodles a try! You can always tell them that it's a new type of green pesto. With all the garlic and parmesan in it, you could barely tell the difference! Just a friendly FYI… be aware that this isn’t an appropriate lunch when you have to give a really important meeting, or if you’re going on a date. Unless your date eats these garlic noodles, too. Garlic breath is a silent but smelly killer. This is the perfect holiday kale salad to make especially during December. It's delicious and easy! Whether you're going to potlucks, or want to eat something a little festive this winter, this holiday kale salad fits the bill. The avocado in the dressing of this salad will soften up the kale and it imparts a creamy and delicious texture. When combined, the basil, tomatoes, avocado, and lemon make a creamy dressing that really compliments the kale and the rest of the salad ingredients. A few weeks ago, I finally found a way control my passion for peanut butter without having to eliminate it from my diet altogether. Rather than consuming the condiment by itself, I've been incorporating it into smoothies and energy balls. I add a bit of protein powder to the mix so that I immediately feel full and stay that way. This definitely keeps cravings at bay and it has trained me to eat when I'm actually hungry, instead of bingeing when I encounter the slightest bit of stress. Recipe originally posted on The Healthy Maven. Find her blog here. Happy New Year PumpUp readers! I’m back for another monthly blog post. If you’re anything like me you’ve probably kicked off 2015 with a whole list of goals for the year. Thank goodness for this amazing PU community to keep us accountable, am I right?! My list is surprisingly short this year. Instead of committing to finally stop biting my nails (unsuccessful 3 years in a row) or eating healthier I’m focusing on the positive things I can bring to my life to make it a little happier and brighter. One of these things has been finding a workout that really motivates me to get active and doesn’t dread exercise. Thankfully, 2014 pulled through at the last minute and introduced me to an amazing workout called Barre3. I’ve committed to the Barre3 challenge in January and have found myself excited to hit the barre 4 days a week! Another positive addition to my life has been this Asian Chopped Kale Salad with Miso Sesame Dressing. I was on a mission to make salads interesting and delicious in 2015 and it’s safe to say I got off to a good start. Today I challenge you to make your life a little happier and brighter. Focus on the positive and what you can add to your life rather than what needs to be removed. This is my mission for 2015 and I hope you’ll join me for the ride. Snacking can be a problem for a lot of us, and often we mindlessly eat when we aren’t even hungry. Sometimes you can end up snacking on food throughout the day that causes you to double your calorie intake! Ugh oh! We’ve got 10 healthy snack ideas to satisfy your snacking sweet tooth! Kale is the biggest new trend, and if you haven’t tried it yet it’s time to jump on the bandwagon! Kale is full of nutrients, good for heart health, eyesight, and weight management. 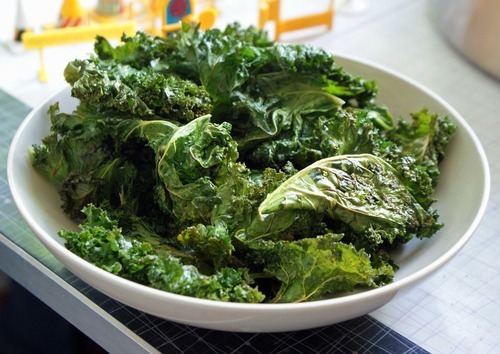 Kale chips are an awesome snack and with limited toppings you are still keeping the good nutrients inside the kale. First off, wash the kale in water and then dry it in a salad spinner. Cut up the bunch of kale into bite sized pieces and put into a bowl. Drizzle on the olive oil and sprinkle the sea salt. Spread out on a non-stick baking sheet and bake for 10-15 minutes, until the edges are browned! The chickpea mixture we all know and love as hummus has a ton of great nutritional benefits! It is high in protein so you can feel full after eating it, as well as calcium, and Omega 3 Fatty Acids. Chickpeas can lower you cholesterol and reduce your cancer risk. It is also an awesome alternative to other spreads or dips that are high in fat with no real benefits. 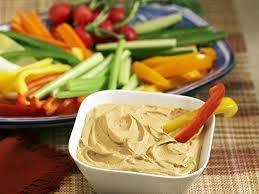 We have the simplest recipe for some delicious hummus to dip with your veggies. In a blender or food processor combine garbanzo beans, garlic, cumin, salt, lemon juice, and olive oil. Blend on low speed, gradually adding reserved bean liquid, until desired consistency is achieved. Do you love crunchy chips but hate the calories, fat, and salt in them! Well hello apple chips! These delicious chips are sweet, easy to make, and a great snack to bring with you at any time. Spray Cookie sheet with non-stick Cooking Spray. 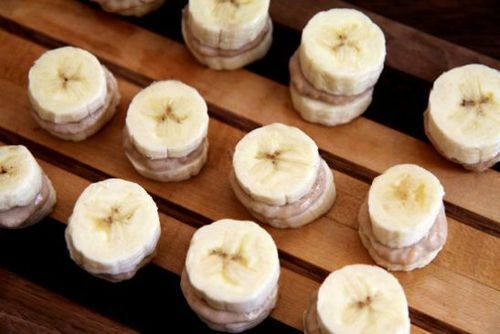 Arrange apples slices on a metal baking sheet. Mix sugar and cinnamon together in a bowl; sprinkle over apple slices. Bake in the preheated until apples are dried and edges curl up, 45 minutes to 1 hour. 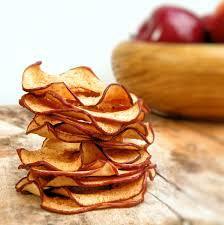 Transfer apple chips, using a metal spatula, to a wire rack until cooled and crispy. What do we like better than a bowl of fresh fruit on these hot summer days? Well we have something that is better, a bowl of frozen fruit! 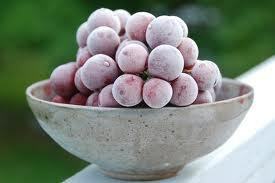 Yep, we want you to try some frozen grapes, because they are a whole ‘bunch’ of yummy. Grapes are classified as a low-glycemic index food, and studies link grapes to improved blood sugar balance, insulin regulation, and insulin sensitivity. Grapes are packed with health-supportive nutrients, vitamins, and tons of antioxidants phytonutrients. They also have benefits on the cardiovascular system, respiratory system, and blood sugar regulating and nervous system. Pick your favourite kind of grape and thoroughly wash them. Pat them dry and put into a Ziploc bag, sealed tightly. Bananas are one of the healthiest fruits around, and we should all be upping our intake of this superfood (don’t believe us? Read our blog on bananas to be convinced). We give you banana nibblers, a frozen treat that are way to easy to be as delicious as they are! There are times when no matter what we cannot satisfy that fry craving. 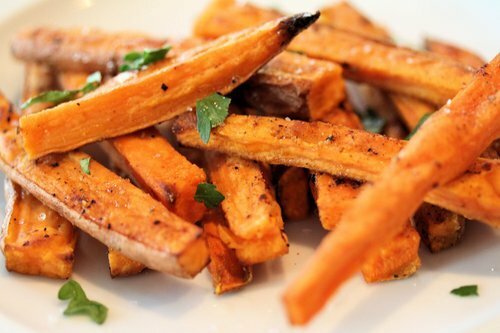 Sweet potatoes are a great healthy alternative and you can easily turn them into restaurant quality fries. Move aside Gordon Ramsay, here is a delectable sweet potato fry recipe that is high in iron, magnesium, vitamins C and D, and potassium. Peel and slice the sweet potatoes so that they look like fries. In a large mixing bowl drizzle the oil over the potatoes and then sprinkle on all of your spices, salt, and pepper. Lay the fries down evenly on a non-stick cooking sheet and bake for 10 minutes, then flip, and bake another 10 minutes. Fries are done when browned on the outside and soft on the inside. 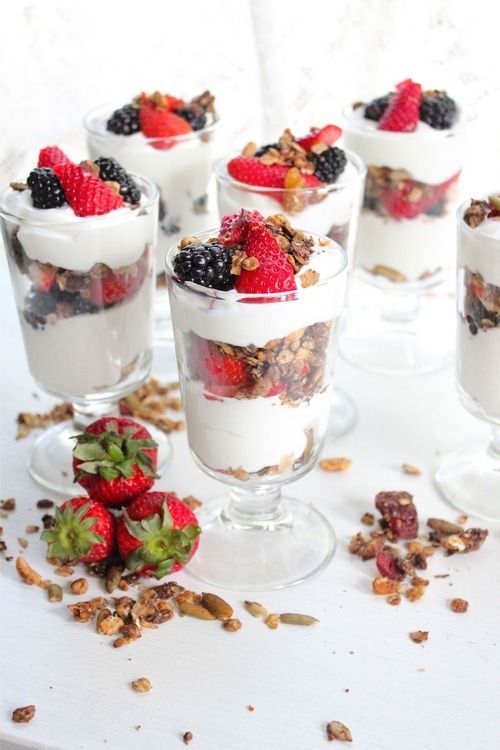 Dress up your plain old greek yogurt and add some fun things to turn it into a yogurt parfait that is good for you and tastes like it came from the Greek gods! Line up 4 tall glasses to put the parfaits into. Spoon 2 tbsp. of yogurt into each glass. Spoon 1 tbsp. of granola on top of the yogurt. Spoon 2 tbsp. of fruit over top the granola. Keep repeating the process and add a bit of honey to sweeten it up! 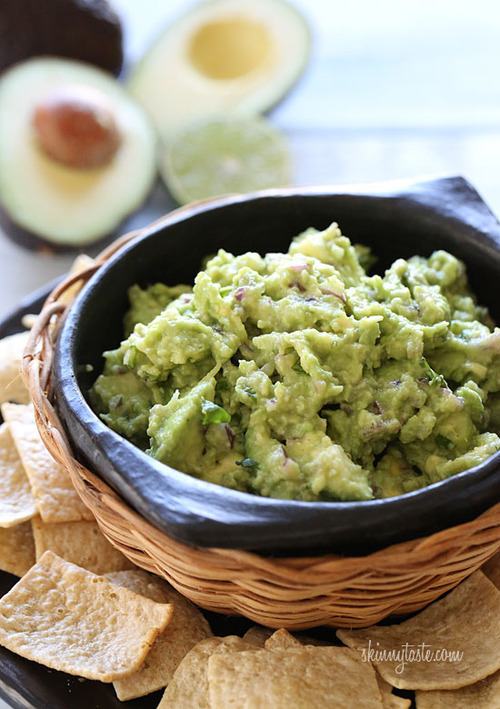 Guacamole to dip in some some whole-wheat tortilla chips or crackers is an awesome snack and tastes so darn good. Avocados are high in fat, yes, but it’s all good fats that we should be consuming every day. They are also high in fiber, rich in vitamin B, E and K and have 60 percent more potassium than bananas! Place the pulp from the avocados in a medium bowl and slightly mash with a fork or a potato masher leaving some large chunks if you like! Add lime or lemon juice, salt, pepper, cilantro, red onion, garlic and mix thoroughly. 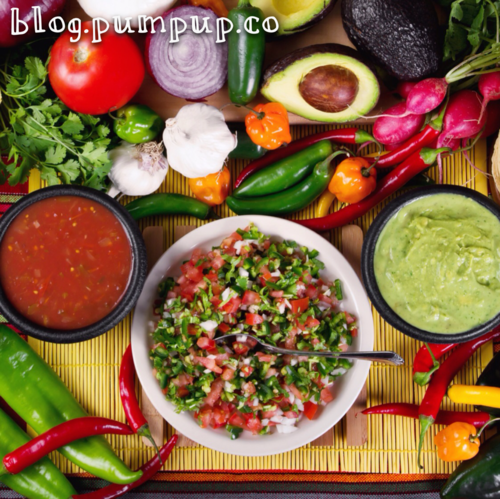 Tip: If you are serving this at a later time, a great tip to keep the guacamole from turning brown is by placing the pit in the bowl with the guacamole and cover. We love apples any time, all the time, so try turning this fruit into a really great snack or dessert! Chop up your apple into bite sized pieces and put into a small bowl. In a separate bowl add the peanut butter and melt in microwave for 30 seconds, or until it is warm and gooey. 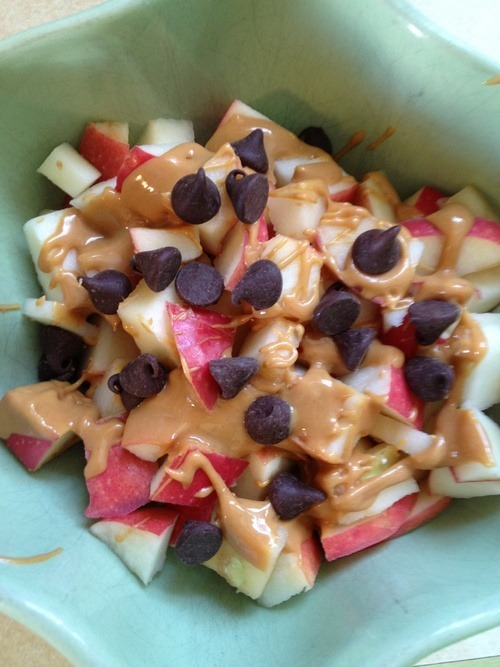 Scoop peanut butter on top of the apples and sprinkle the chocolate chips on the peanut butter. Mix it all up and enjoy! Air pop your own popcorn for a serious treat. Popcorn is actually full of fiber and has more antioxidants that most fruits and veggies, and is also a natural whole grain! 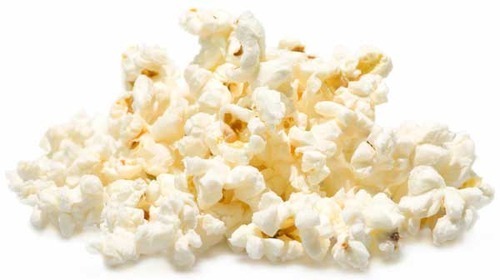 So skip the movie theatre and bagged popcorn that is full of salt and butter, and try popping your own for an awesome snack!